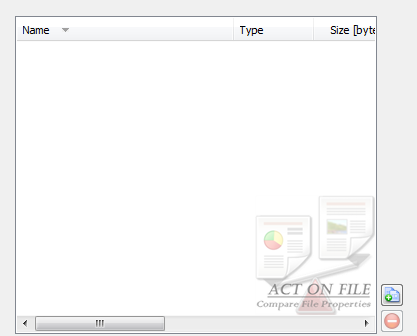 Act On File 2012 - The Comparator Module - The Compare File Properties Functionality Compare File Properties - Easily Compare Files By Meta-Properties, Content and Attributes. Compare File Properties - Compare Files By Content, Generic Attributes, and Meta-Properties. This section discusses the Compare File Properties functionality of the Comparator module. The Compare File Properties functionality is used to compare files by all of their known properties, such as: content, filename, size, times, attributes and all recognized data and meta properties. For example, a binary data file has only generic properties that are known, but besides these an image also has many other known properties, such as: height, width, color scheme, palette, time of capturing, geographic location, etc. 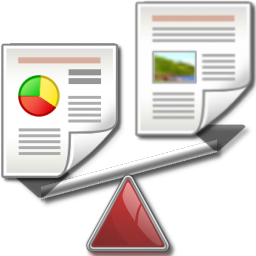 The Compare File Properties functionality helps find matching, duplicated, derived and otherwise related or non-related files and folders. Select the files that you want to compare. Adjust any applicable settings. Click the Compare button. Once the comparison process is complete you can see the results listed in the result window. Each new property found in a file is placed in a new row, thus every property type found in the files has its own row. The filename of each file is placed as a column title. Since every file has its own column, it crosses all rows. Therefore, if a file has a property of some type, its value is placed on the respective row for that property type. Thus the result of the comparison operation is a table of all properties found in all of the selected files. Unlike the Compare Files and Folders window, here it is possible to select more than one row in the result window. If you select a row in the result window, the files that have that property will be listed in the Selected Properties Aggregation window together with the value of that property for each file. If you select more than one row (i.e. property), Act On File will display a intersection or union on the files that have the selected properties (rows). The Aggregation Operator control defines whether to display intersection or union on the files. When the aggregation operator is set to intersection, a file will only be displayed if it has all of the selected properties. When the aggregation operator is set to union then a file will be displayed if it has at least one of the selected properties. Using the context menu in the Selected Properties Aggregation view, you can perform typical file/folder manipulation operations and locate the file in the selected items view and in the file system. These controls are used to select and display the files for the operation. In addition to the Add Files and Remove buttons, you can use the standard clipboard, drag and drop, and keyboard operations. Note that this functionality works with files only. These controls are used to control the operation of the module. Ignore file content Comparing the file contents could be a lengthy procedure; if this is not necessary, you can save some time by omitting it. Image custom data Id [hex] For certain image types only: enter custom data Id as a hexadecimal value to be compared. These controls are used to display the results of the comparison and the properties of the selected matches in the results view. Aggregation Operator combo-box Select the logical operator to be used when more than one property criteria is selected. Intersection Only files that have all of the selected properties will be displayed. Union All files that have at least one of the selected properties will be displayed. This context menu is used to manipulate the selected matching items that are displayed in the Selected Properties Aggregation view. 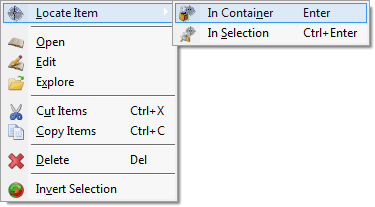 Locate Item Locate the selected file: (1) In Container - on the disk; (2) In Selection - in the selection view control. Open Execute "Open" shell command on the selected file. Edit Execute "Edit" shell command on the selected file. Explore Execute "Explore" shell command on the selected file. Cut Items Cut the files; same as if the cut was performed in the file container. Copy Items Copy the files; same as if the copy was performed in the file container. Delete Delete the files; same as if the delete was performed in the file container. Compare Compare Commits to compare the selected files.